Trello is a tool that has really upped my organizational and productivity game! It’s an app, BUT if you’re not a smart phone person, it works wonderfully on your PC, too. I use both options equally. 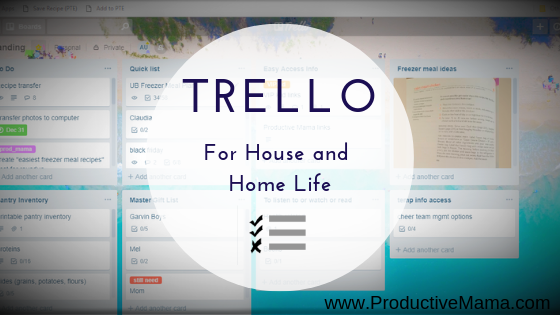 Organize Your Life with Trello course. You do NOT need this course to use Trello! But it WILL decrease the time it takes to learn and you get some free “boards” to help you get going right away and to offer solid examples of use (think menus, weekly planning, budgets, and more. I have already adopted the camping list). You will also be soooo ready to use the Make Ahead Holiday Meal Planner I developed. A downside to Trello: it’s SO flexible and can be used in SO MANY ways, I could see those new to online organizing crossing their eyes a little. But it’s worth the learning curve! I highly recommend this FREE class, the Organize Your Life with Trello Mini Class, which shows you a few of the best ways to get started with Trello, helping you adopt it for menu or weekly planning. This mini class is probably enough to launch you into pro status. 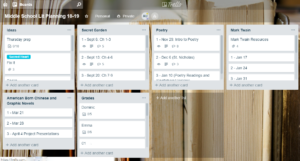 I am using Trello where I have not been able to make good use of Evernote and Asana (two tools I love, but don’t seem as good for dynamically changing projects). The great advantage is that accessing Trello is so easy that all of those ideas that float around in my head, are forgotten and then resurface at inconvenient times can actually get written down and stored! gift ideas. Way better with Trello! So much easier to keep track of ideas and what I actually HAVE. Middle School Lit class – I’ve started using this for planning my class and for organizing lessons. Stay tuned for a video on this! parent feedback for VIPKID! – I am SO excited about this one that I made a video to share how I do this. I need to keep track of what I’ve told parents of my regular students, what rewards I’ve used, class issues, etc. This is SO AWESOME for feedback. I use it in conjunction with SpeechTexter for efficient feedback. In short, each student is a list, each list has a month card and each feedback in that month is a comment, which automatically dates the class for me. If it sounds confusing, it won’t after you spend ten minutes with Trello. Any cooperative endeavor where you have a role: PTO, bulk buying club, ministries, choir, women’s groups, homeschool groups, etc. Family Bulletin Board to keep the Teens and I on the same page in many areas. Here’s my video about that. groups and teams – including a freezer meal club!!! What a great way to organize, schedule, share recipes and more. Again, YOU DO NOT NEED TO PAY ONE CENT TO USE TRELLO! So check it out and see how it might help you, whether you have zero kids, eight kids, a homeschool class of 2, traditional classrooms and 75 students, run a business or are CEO of your home. Check out my youtube playlist featuring just a few videos showing how I use Trello.